Lovely & comfortable 5 Bedroom home that has been completely renovated & expanded in 2011. Its a short five to nine-minute walk to the beach. Our address is 7 Shelley Court and we are on a quiet cul de sac. The spacious living room with 55' HDTV w DVD, has multiple French doors to the large, comfortable, screened-in porch. This porch overlooks the swimming pool. The pool was completelty refurbished in 2010. The pool may be heated for an additional surcharge. The downstairs MBR with king-size bed and HDTV/DVD has access to a sundeck that leads to the swimming pool. The new master bath has a walk-in shower. The home has wireless access. The opposite side of the home has two guest bedrooms downstairs and a large laundry room. The first bedroom has two twin beds, and HDTV and an ensuite bathroom with shower. The second bedroom has a queen size bed, an HDTV and two large closets. This room also has French doors to the screened-in porch and pool. Two brand new bedrooms have been added upstairs. The first one is a huge MBR with King Size bed, large ensuite bath with shower and large closet. The second has 2 sets of bunk beds, a large ensuite bathroom with shower and huge walk in closet. The large kitchen has a skylight and French doors leading to the screened-in porch. Plenty of indoor and outdoor seating for over 25 people! There are wooden floors throughout the home, except for the guest bedrooms, which are carpeted. This home has a stereo with CD and DVD player, fireplace, and ceiling fans throughout. The THE HOME HAS WIRELESS INTERNET SERVICE. more photos of the house are available by request. Hilton Head is such a wonderful place for enjoying the outdoors, shopping, golf, tennis, biking or just hanging at the beach or pool! There are so many wonderful restaurants to choose from and plenty of activities to keep kids, teens and adults happy! We love preparing a good meal in our kitchen and enjoying the time with friends and family while relaxing in the screen porch or out by the pool! only a few steps to manage with most 3 bedrooms and 3 bathrooms on the main floor. One of the largest pools in PD, measures approximately 38 feet by 18 feet. With my adult kids traveling from Seattle and Charleston, we needed a place big enough to hang out for the week of Christmas, comfy enough to have meals together, watch movies together, etc. but with room for everyone to have their own space. THIS WAS PERFECT for us :) We really couldn't have asked for more -- beautiful home, great TV/Stereo setup, reliable Wifi, fully equipped kitchen/laundry, comfortable beds, convenient location. Thank you and so glad you could enjoy quality time with your family in our Second home. We really enjoyed this home. It had everything we needed. Look forward to returning in the future. Wonderful experience with this home and the owners/mgmt company. We had 3 families with 6 kids ages 5-15 and adults. The home was very spacious, conducive and comfortable for everyone. Plenty of space to eat and play games together and space for kids to play alone, even seems more spacious than pictures. Pool and patio area was great, plenty of chairs and seating. Walk to the beach was quick and easy, community the home was in was very nice, with plenty of sidewalks and access for walks or biking, surrounding areas offered plenty of shops and restaurants. House was well stocked with "bonus" items such as waffle maker, crockpot, beach chairs, bikes, pool toys, stroller, kids booster seat, and more than enough linens, towels, etc. House well equipped with tvs, stereos, laundry, dishwasher, etc. Dealing with owners and mgmt company was easy and pleasant with quick response rates. We had a delay in pool heating so only comment would be to confirm that process if requesting. Overall we had a wonderful vacation and this property allowed for a great trip and great memories! This was a great house that accommodated two families very comfortably. Big bedrooms, extremely comfortable beds (my daughter said hers was the most comfortable bed she had ever slept in), good living space, a smallish but well equipped kitchen and great bathrooms. The pool area was a leafy oasis with a very decent sized pool that was shady all morning and in the later afternoon. The outside area could do with a lick of paint and a clean up of the patio furniture but that did not impact our stay. The bikes and pool chairs to borrow were a great bonus. The location was great in Palmetto Dunes near the tennis courts, store and a short drive to Kroger/Wholefoods etc at Shelter Cove and a short walk to the beach. We had a fantastic time here and would definitely come back. While this home has potential for being a great rental, I'm very sorry to say it was simply not cleaned properly. The rental company said they inspect after the house is cleaned but we are unsure whether that was done. We expected a clean home for the week and that is not what we got. The kitchen cabinets were dirty both inside and out, dirty dishes were put away in the cabinets and drawers, the range hood was covered in grease and dust, and the backsplash in dust. The couch had sand all over it, dust underneath it, and dust and bugs behind the stereo. The screened porch table and ledges had not been cleaned. We spent time cleaning a grill that had not been cleaned in many months, as well as the outdoor table. The outside of the windows were dirty and had spider webs all over. The upstairs was nice and somewhat cleaner. Washer had standing water and moldy dispensers, dirt and dust on top of washer, dryer and fridge in laundry room. Garage full of spider webs and outdoor debris. No excuse for not cleaning these things prior to our arrival. Maintenance requests for fridge and AC were handled extremely well. Pool is a great size. Just needs a good thorough cleaning!! I will certainly address some of your complaints with our management company who hires the cleaners and inspects the property. Sand in the sofa and dirty dishes in the cabinets and dust under sofa and on top of washer & dryer are unacceptable for sure. The cleaners must have rushed which I will address. As far as cobwebs in the garage and on the outside of the backporch screen, this is not something the cleaning company handles on a weekly basis. It comes with Island living and the nature of a rental property. The reviews tell a great story about this home...very spacious for family gatherings indoors and out, big bedrooms and updated bathrooms are wonderful additions. One of the best surprises for our families was the fact that the home is on a quiet cul de sac so our kids could safely play in the front and back yard areas and we could see them from the living room. The walk to the beach is 5-10 minutes and very convenient. Even when it was windy on the beach, it was quiet and comfortable in the back yard. Did I mention the pool? 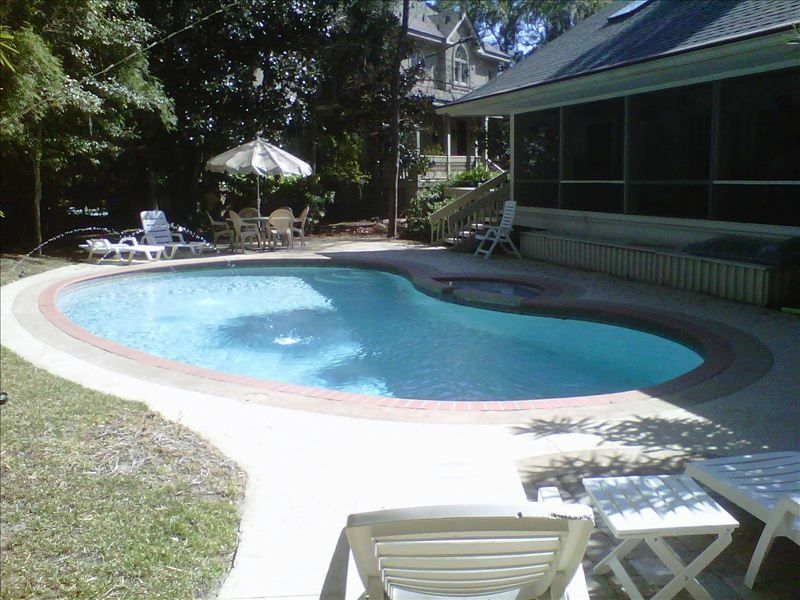 We have rented 5 other homes in Palmetto Dunes and this home has the biggest pool by far! All in all, we will be back and we highly recommend this home for a great family vacation!